Do you read Jane's Apron blog? Julie from St Louis writes a great blog that is tops on my google reader list. Julie was just talking about a swap package that she is sending out, some fabulous stuff I must say. Julie creates and embellishes items using vintage sewing patterns. Something near and dear to my heart. Anything vintage sewing gives my blood pressure a little spike. Reading Julie's most recent post gave me the idea to write about selling on the internet and how I package my outgoing items. My BFE (best friend extraordinaire, I'm moving on from BFF) Beth did a nice little blog post about this same subject. Getting a pin cushion from Beth is like getting a spectacular birthday present. Since I am sending out items that I have created and sewn from vintage fabrics and such I thought it only fitting that the wrapping should have a vintage sewing theme too. The added bonus is that I am recycling something that would very likely end up in the trash. I'm going to package up this Craft Diva Apron for shipping so I have got out my dated (not really vintage yet) patterns, packages of sewing notions like stretch lace, seam binding, blanket binding, etc. 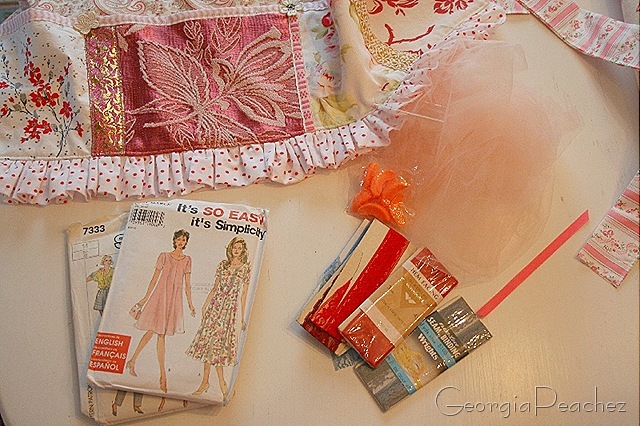 I like to send out something a little extra too so I have the tulle and peach slices (huh?) there also. Don't ya always see those bags at the thrift store full of bad patterns from the 70's, 80's and 90's. Also the bags full of packaged sewing tapes and trims, the ones nobody has a use for. Usually they are cheap, cheap, cheap. Really they should just give me this stuff and be grateful that I am taking it off their hands. Here it is all ready to go, wrapped in tissue and tied with a ribbon. Business card tucked in with a personal note on the reverse. All my packages go out with a little bundle of peach slices. They are scented wax melts. I hope the effect is such, that when you open your GeorgiaPeachez package, the scent of peaches is a nice little surprise. It looks so beautiful. So fun. And I love the little peaches. What a great little extra. Beautiful, and the peaches are perfect! Absolutely, it’s the details that make the difference! What a cute idea. How fun to get a package wrapped like yours! Too fun! Now I can’t wait for the bag I ordered from Beth to see how she packages stuff! Love the scented peaches idea- Fabulous! I’m not sure I can trust AOL to move my archives over, so I’m saving them on my computer just in case! Guess what? Julie (Jane’s Apron) was MY Sweet & Sinister swap partner… YEP! I’m the one who received all her wonderful creaitons, yummy goodies and super packaging! It was funny because we BOTH packaged with vintage pattern tissue! The things I opened in her box were great…I’ll blog it soon! I love how you’ve done this with your items, too. I have a big drawer full of the trims and do the same…use them whenever and wherever I can! I have all colors. Oh, I almost reached into the screen to eat the orange slice. Silly me, I though it was an orange CANDY slice! How nice! I love your business cards. By the way, how did you come up with Georgia Peachez? I’ve always wondered that. Suzy, that is awesome. 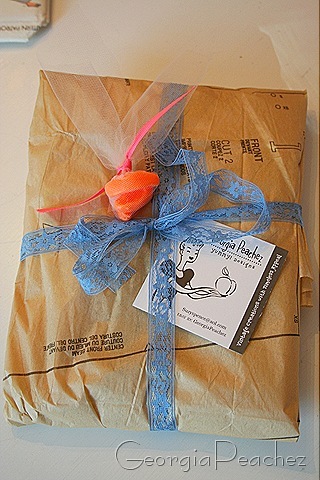 I love the wrapping and nice touch with the peaches. That makes for such a cute package! Hi Suzy, I have received one of your beautiful parcels and thought it was THE best idea to use the vintageish patterns, so much sew ( haha so) that I did the same thing and recycled your wrapping. My peice of peachy goodness is in a cupboard in my studio that I keep all my tags and stamps and inks etc in and everytime I open that cupboard it smells beautiful and I am reminded of you ( and my grooovy bag). Happy day, Kiss Noises Linda Lilly Cottage. I love the business card/peaches combo that you use! How “fun”! I really enjoy your blog and seeing your creative ideas! Oh, Suzy, I’ve received one of your packages and it was just spectacular! 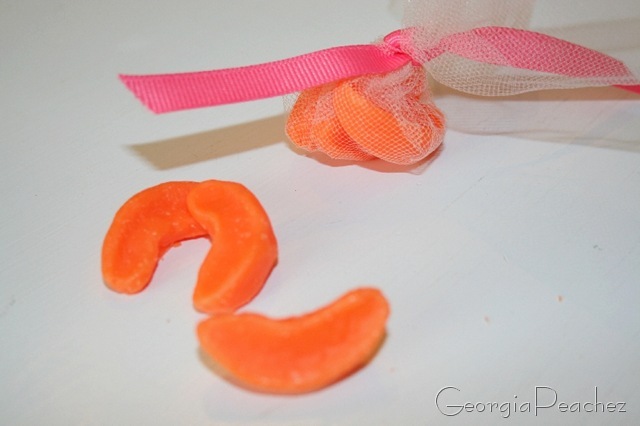 I loved the peach wax melts…and so did my linen closet. And the pattern you used to wrap my apron in – it is now “wallpaper” in my sewing closet. Needless to say, your attention to detail is much appreciated! LOVELY package Suzy! I love that I now have a reason to buy those yucky 1980s patterns that are in abundance at the thrift store. What a great idea! Wouldn’t you know that just last week I tossed all the contents of the patterns I’ve been gathering? Murphy’s law I suppose.